An example of a Humane Society agent badge. The Fayette Regional Humane Society (FRHS) has received calls in the past two weeks about men approaching local homes and impersonating humane society officers. The first call came to FRHS on Tuesday, Feb. 13, according to Brad Adams, humane agent and outreach director. A resident on North Bend Court in Washington C.H. reported that a male, approximately 19-years-old with dark-colored hair, wearing a black polo shirt and driving a maroon-colored Ford Taurus, knocked on their door. According to the caller, the male said he was with the “Fayette County Humane Society” and received a report about their Boxer dog. Then on Monday, a female resident on Peabody Avenue reported that a man rang her doorbell at noon on Monday and said he was with the humane society, according to Adams. The man reportedly told her that he received a report about two basset hounds outside in the cold barking, and that he was there to pick them up. The caller reported the man to be white, approximately six feet, one inch, weighing around 150 pounds, with brown hair, wearing a light blue shirt with a badge around his neck, and driving a “newer” white Chevy SUV, said Adams. Following each incident, the FRHS immediately notified the Fayette County Sheriff’s Office and the Washington Police Department to report the residents’ accounts. The Fayette Regional Humane Society employs three state-certified humane agents who drive vehicles with a humane society badge on the door panels, said Adams. The humane agents wear black uniforms bearing a badge along with full names. Adams, Danyel Bageant and Bobbi Honicker are the only sworn agents in Fayette County. Adams said the three of them will always verbally identify themselves using their position title and full names. The agents will also produce further identification upon request. “If anyone is suspicious of a person who is claiming to be a humane society representative and is unable to produce clear identification, please contact law enforcement as soon as possible,” said Adams. 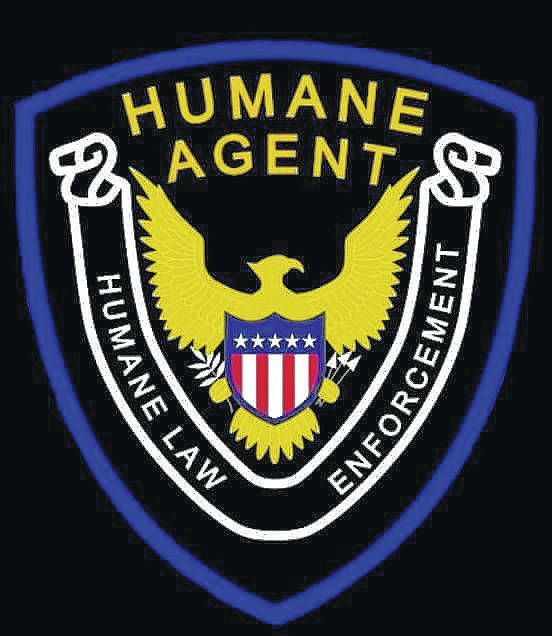 https://www.recordherald.com/wp-content/uploads/sites/27/2018/02/web1_Humane-Agent-Patch.jpgAn example of a Humane Society agent badge.